Everyone knows pushing the brake pedal with your foot means your car should stop, but what’s actually going on beneath the surface? A relatively simple system connects the pedal to a power booster, which uses either an engine vacuum or hydraulic pump (depending on the vehicle) to transfer force to the vehicle’s master cylinder. This force is then transferred to push brake fluid through lines to each wheel cylinder, slowing the vehicle down by applying pressure down on your rotors by a brake pad on each side of each wheel. 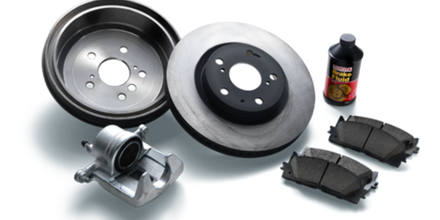 Through continuous use, your brake pads, the calipers that hold them, your rotors and less often your brake lines all wear down and eventually need servicing and/or replacing to keep the system functioning correctly. Brake service is required roughly every 80,000 km or otherwise if you notice anything out of the ordinary with your brakes like a squealing sound, spongy feeling, or an indicator light in your dash. 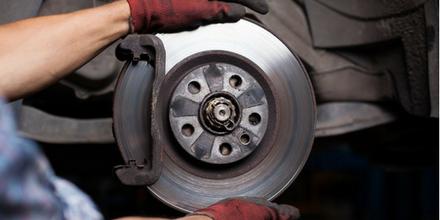 As mentioned, brakes will wear down naturally with long term use, and any of these symptoms can become a problem during a given service interval and when they do it is crucial to get your brakes serviced as soon as possible. Functioning brakes are really the number one line of defence when it comes to keeping you and your passengers safe in your vehicle. Risking a brake malfunction is never worth it, so for your peace of mind Book a Service Appointment at Sherwood Park Toyota to make sure your brakes are in top shape. Visit us at 31 Automall Road, Sherwood Park, AB T8H 0C7 or give our expert Service Staff a call at (780) 410-3812 for more information.